Giuseppe Arcimboldo (also spelled Arcimboldi) (1527 – July 11, 1593) was an Italian painter best known for creating 'Composite Heads', imaginative portrait of heads made entirely of such objects as fruits, vegetables, flowers, fish, and books – that is, he painted representations of these objects on the canvas arranged in such a way that the whole collection of objects formed a recognizable likeness of the portrait subject. Arcimboldo's legacy (see below) continues well into the present age, see for example, the films of Jan Švankmajer and the latter's bust sculpture Beethoven by Arcimboldo. His father, Biagio Arcimboldo, was an artist. Like his father, Giuseppe Arcimboldo started his career as a designer for stained glasses and frescoes at local cathedrals when he was 21 years old. At a distance, his portraits looked like normal human portraits. However, individual objects in each portrait were actually overlapped together to make various anatomical shapes of a human. They were carefully constructed by his imagination. Besides, when he assembled objects in one portrait, he never used random objects. Each object was related by characterization. In The Librarian, Arcimboldo used objects that signified the book culture at that time, such as the curtain that created individual study rooms in a library. The animal tails, which became the beard of the portrait, were used as dusters. By using the everyday objects, the portraits were decoration and still life paintings at the same time. His works showed not only nature and human beings, but also how close they were related. After the portrait was released to the public, some scholars, who had a close relationship with the book culture at that time, argued that the portrait ridiculed their scholarship. In fact, Arcimboldo criticized the phenomenon of the rich people’s misbehaviour and showed others what happened at that time through his art. In The Librarian, although the painting looked ridiculous, it criticized some wealthy people who collected the books in order to satisfy their ownership, instead of to read the books. Arcimboldo died in Milan, to which he retired after leaving the Prague service. It was during this last phase of his career that he produced the composite portrait of Rudolph II, as well as his self-portrait as the Four Seasons. His Italian contemporaries honoured him with poetry and manuscripts celebrating his illustrious career. Arcimboldo is known as a mannerist in the 16th century. The Mannerism was a transitional period from 1520 to 1590, which adopted some artistic elements from the High Renaissance and influenced the other elements in the Baroque period. The Mannerist tended to show close relationship between human and nature. 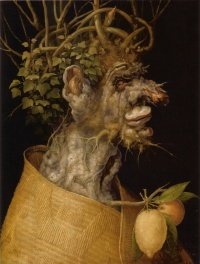 Arcimboldo also tried to show his appreciation of nature through his portraits. In The Spring, the human portrait was composed only of various spring flowers and plants. From the hat to the neck, every part of the portrait, even lips and nose, was composed of the flowers while the body was composed of the plants. On the other hand, in The Winter, the human was composed mostly by the roots of the trees. Some leaves from evergreen trees and the branches of other trees became hairs while a straw mat became the costume of the human portrait. According to Giornale Nuovo, "it is thought that the following prints [the so-called Humani Victus Instrumenta series], published in Venice by one Giovanni Francesco Comocio, in 1567 and ’69 respectively, depict two lost ‘composed heads.’ There is documentary evidence for a canvas of Arcimboldo’s on the theme of Agriculture; and a personification of Cookery was one of a pair of his paintings known to have been in the Müller collection in Prague until WWII. 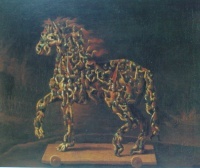 Another lost work is Trojan Horse. The bizarre works of Arcimboldo, especially his multiple images, were rediscovered in the early 20th century by Surrealist artists like Salvador Dalí. The exhibition entitled “The Arcimboldo Effect” at the Palazzo Grassi in Venice (1987) included numerous 'double meaning' paintings. Arcimboldo's influence can also be seen in the work of Shigeo Fukuda, István Orosz, Octavio Ocampo, and Sandro del Prete, as well as the films of Jan Švankmajer. The 1994 short story The Coming of Vertumnus by Ian Watson counterpoints the innate surrealism of the eponymous work against a drug-induced altered mental state. "Although Arcimboldo was extremely famous during his lifetime, he was soon forgotten after his death. There was almost no mention of him in the 17th and 18th centuries, and it was not until 1885 that a treatise by Dr. Carlo Casati appeared, called Giuseppe Arcimboldi, pittore milanese, in which he is mainly seen as a painter of portraits." -- Werner Kriegeskorte. The same year saw the publication of Arcimboldo et les Arcimboldesques by Francine-Claire Legrand and Felix Sluys. A book by Andreas Beyer called Giuseppe Arcimboldo. Figurinen, in 1983. Arcilmboldo's works can be found in Vienna's Kunsthistorisches Museum and the Habsburg Schloss Ambras in Innsbruck, the Louvre in Paris, as well as numerous museums in Sweden. In Italy, his work is in Cremona, Brescia, and the Uffizi Gallery in Florence. The Wadsworth Atheneum in Hartford, Connecticut, the Denver Art Museum in Denver, Colorado, the Menil Foundation in Houston, Texas, the Candie Museum in Guernsey and the Real Academia de Bellas Artes de San Fernando in Madrid also own paintings by Arcimboldo. Unless indicated otherwise, the text in this article is either based on Wikipedia article "Giuseppe Arcimboldo" or another language Wikipedia page thereof used under the terms of the GNU Free Documentation License; or on original research by Jahsonic and friends. See Art and Popular Culture's copyright notice. This page was last modified 08:55, 11 January 2014. This page has been accessed 28,436 times.